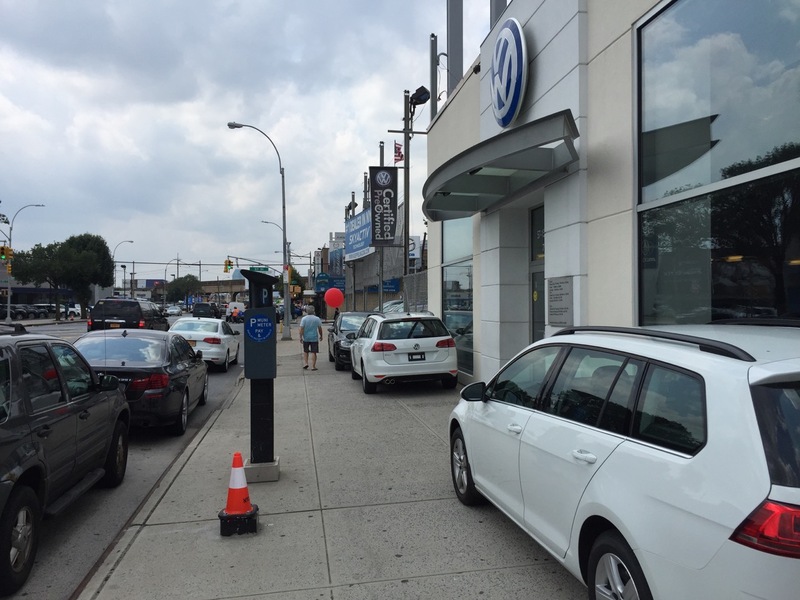 As a matter of practice, car dealerships along Northern Boulevard, one of the most dangerous streets in Queens, illegally use its sidewalks and curb lanes as a showroom for vehicles. NYPD doesn’t enforce against the appropriation of sidewalks and won’t answer questions about it. 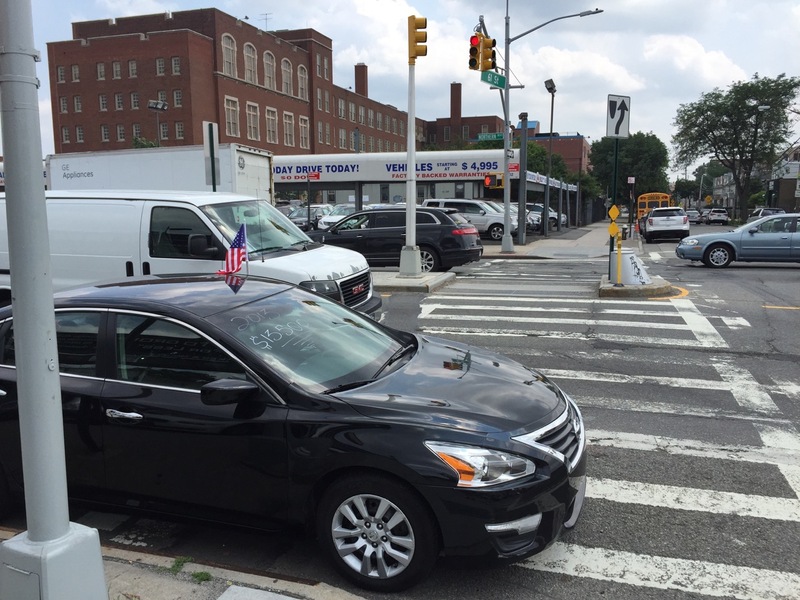 Streetfilms’ Clarence Eckerson recently walked down Northern Boulevard in Jackson Heights and found cars for sale blocking the pedestrian right of way, including the very crosswalk where a turning truck driver killed 8-year-old Noshat Nahian in 2013. Nahian was walking to PS 152, the school where, later on, Mayor Bill de Blasio chose to first announce his Vision Zero initiative and signed a package of street safety legislation. While the city installed pedestrian islands and banned turns after Nahian was killed, it hasn’t managed to keep the sidewalks and crosswalks clear of cars for sale. A car dealership displays one of its latest models in the crosswalk where 8-year-old Noshat Nahian was killed. Photo: Clarence Eckerson Jr. The issue is common all over the city, but has long been a particular problem on Northern Boulevard, drawing the attention of local advocacy group Make Queens Safer. East of the Brooklyn Queens Expressway in Jackson Heights, the 115th Precinct covers Northern Boulevard. West of the BQE, the 114th Precinct covers the north side of the street and the 108th covers the south side. Towing illegally parked cars isn’t unprecedented: Last month, the 104th Precinct began towing illegally parked vehicles on sidewalks outside an auto body shop on Flushing Avenue. DOT referred all questions about the issue to NYPD, which has not replied to inquiries about Northern Boulevard. In the meantime, car dealers on Northern Boulevard continue to be above the law. It’s just like walking around certain blocks in Mill Basin/Bergen Beach. I’m thinking the time has come to have council members Dromm, Van Bramer, and Ferraras walk Northern Boulevard to see just how choronic the situation is. The photos Stephen used in this article are just three of dozens I took on one walk, typically every dealership breaks one or many of these rules: either cars blocking crosswalks, cars parked illegally in the road interfering with peds & children, or take up legal parking spaces in front of their dealerships without paying for that parking. Chronic is an understatement. I used to live near Northern and 51st Street until 1978. This practice has been going on since I was kid (I’m 52). Nearly every block there are cars on sidewalks. This is not Vision Zero. 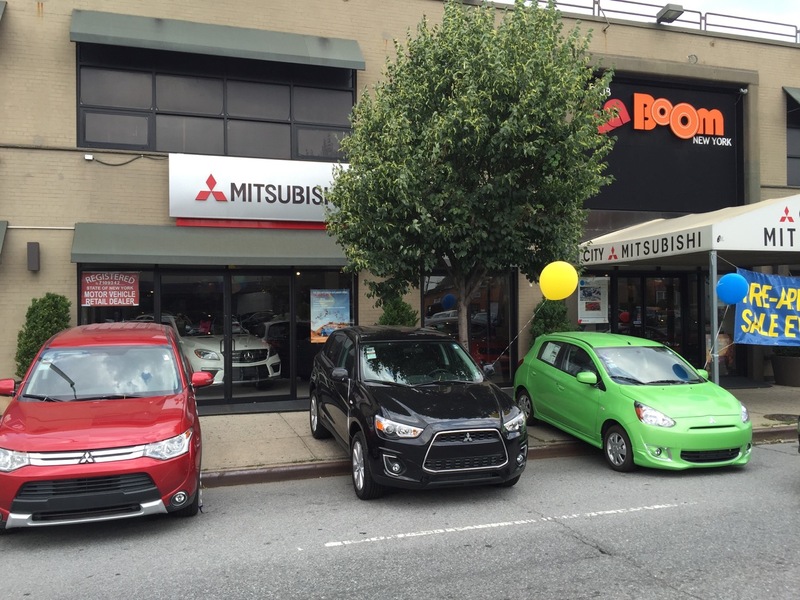 A great sign in front of Bay Ridge Toyota, 6401 6th Avenue, Brooklyn (at 65th St). I am sure readers can do this all day. 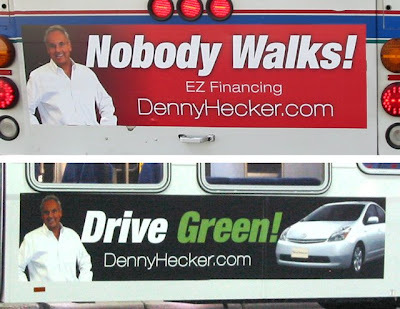 If I walked by these cars every day, I would lodge repeated 311 complaints. If that didn’t work, eventually I might accidentally scrape some cars with my keys. 311 complaints – closed before an officer could have possibly shown up. complain to your city council rep and _maybe_ you’ll get some traction. most likely whichever precinct is in charge just doesn’t see anything wrong with this….unless people speak up and change their mind. The city has allowed this to occur for far too long. It’s time that this practice comes to an end. In the Bronx, there’s an auto repair shop and U-Hual rental business adjacent to the Bruckner Drawbridge (over the Bronx River) which routinely leave automobiles parked along the narrow sidewalk. It’s annoying because this is a bicycle/pedestrian connection and the adjacent street is speeding traffic via Bruckner Blvd. To add insult to injury, the Drawbridge itself is extremely narrow at four points/either side. Of course, if the city cracks down on this (which I wholeheartedly agree it should), you’ll get all these places whining that they’ll go out of business. To which I’ll say “good riddance”. Whatever taxes businesses like these may pay, I’ll bet they cost the city a whole lot more in negative externalities. They also undoubtedly hurt any adjacent businesses which depend upon pedestrian traffic. Besides that, if these businesses can’t afford space for parking their vehicles, or their customer’s vehicles, then their business model isn’t viable. The fact the city hasn’t yet cracked down on these dangerous, illegal practices shouldn’t be taken as an assurance it won’t. If enforcement starts in earnest, the city can rightfully tell these businesses you had a free ride for the last 40 or 50 years. The party’s over. Like you said, a bad situation all around. Yup 311 is a no go in the end. Even a local council person complained to the department on my behalf. No one ever showed up to write tickets. What we need is NY1 or the networks to show up and shame them all. I am working on that. bet someone at that place is buddies with some cops. stick with it and report back. People should just start walking across the top of the vehicles. Especially the “showroom” vehicle parked in the crosswalk. Not only that, up and down Northern Boulevard legal metered parking is practically nonexistent since dealerships hog up all the spaces and don’t feed the meter. Lost revenue.